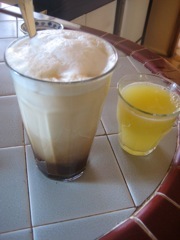 April 25, breakfast. The usual. April 25, lunch. 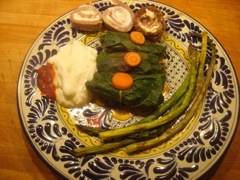 Leftover chard rolls, asparagus, and some potato casserole. All Jan's cooking and delicious! March 25, dinner. 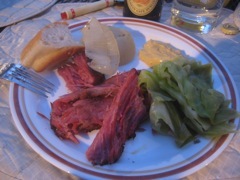 At Don & Barbara's, corned beef and cabbage with a roll. And that's a bit of onion over there too. Good, a nice Sunday evening dinner. April 26, lunch. 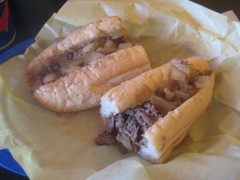 A cheesesteak from Frankie's in Tucson. Lovely. With Jan.
April 26, dinner. 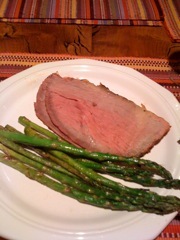 Jan made a roasted beef roll, and sliced it very, very thin. It was roasted on the BBQ, so the flavor was delicious! Also, asparagus. Wonderful dinner at home with Jan! April 27, lunch. 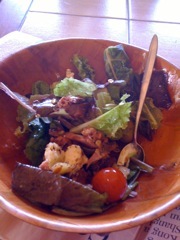 A salad of fresh greens from Jan's garden, plus some of the roasted/bbq beef Jan made the day before. April 27, dinner. 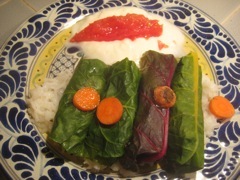 Leftover chard rolls, yogurt, rice, and some tomato salsa. Very nice. April 28, lunch. 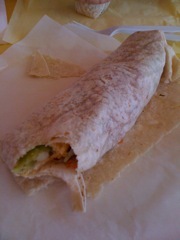 Chile relleno burrito from Nico's Taco Shop in Tucson. Delicious! April 28, dinner. 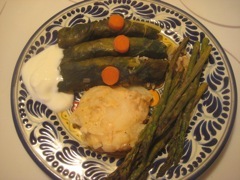 Leftover chard rolls, yogurt, asparagus. And some fresh sheep's milk cheese and beef rolls, sliced across. Nice. 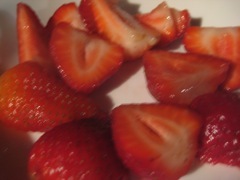 April 28, dessert. Talenti Gelato "Double Dark Chocolate." 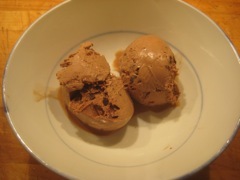 This is a very good gelato (talentigelato.com) and I highly recommend it, especially if you like double dark chocolate! 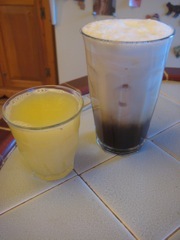 April 29, breakfast. The usual. April 29, lunch. 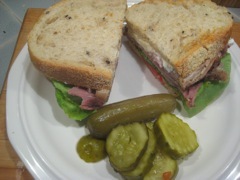 A sandwich of Jan's BBQ/roast beef with lettuce from the garden and tomato, horseradish. On the side, two kinds of pickles (sweet and sour). All done on Beyond Bread rustic rye bread. Delish. At home in Tucson with Jan.
April 29, dinner. Rosa's Mexican Restaurant. 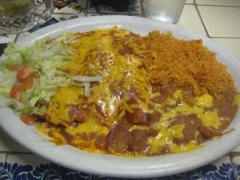 Three carne seca enchiladas, rice, and beans. With Jan, Don, Barbara, and Dale. 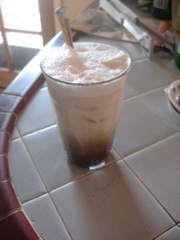 April 30, breakfast. The usual. April 30, lunch. 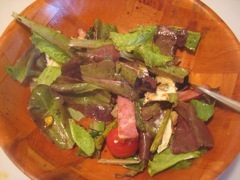 Salad from Jan's garden, plus tomatoes, nuts, tuna, and cheese. April 30, dinner. 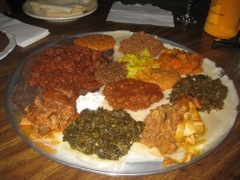 Zemam's!!! It must be Friday night! With Rose and Mark and Jan, in Tucson.